Tried visiting this place early on Bank Holiday Monday afternoon. Despite most other places around being open, this one was closed. 0/10 from me. 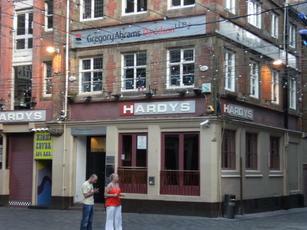 On Matthew Street where we were lured in by the free jaegerbomb we could get when we bought a drink. To be honest it was probably better than tbe 80s bar, better priced as well (although not really saying much as it was still extortionate). If youre around the area and want a bit better value for money then this is a better place to go, all keg beers and ciders. Small and a bit cramped. Drink prices were reasonable and the music was modern so it wasnt too bad - we preferred flares tho!! !